Developed for industrial applications, the AutoPSI-S combustion pressure sensor delivers a low-cost and reliable solution for production engine monitoring and control applications. With a unique fiber optic construction, the sensor is able to operate at high levels of Electro-Magnetic/Radio Frequency Interference (EMI/RFI) fields and high temperature. The opto-electronic circuitry is packaged in a small rugged enclosure, eliminating the need for a separate interface unit. The sensor can be easily powered and read by the Engine Control Units (ECU); or systems such as Combustion Analysis for Gasoline, Diesel and Natural Gas Engines, Prognostic and Condition-Based Maintenance, Paramteric Emissions Monitoring, etc. 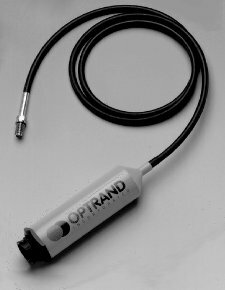 Optrand patented auto-referencing circuitry maintains sensor accuracy and drift-free operation over millions of pressure cycles. Sensor reliability is ensured by a health monitoring (diagnostic) output signal. AutoPSI-S sensors can be calibrated with static pressure calibrator or dead weight tester. Sensors can be installed either directly or through an adapter into the cylinder head, in the indicator port/Kiene adapter or integrated with Optrand measuring spark plug, PSIplug or CALplug.